Senwesbel reports are grouped according to the specific financial year under review. The condensed consolidated interim results of Senwesbel Limited (the “company”) as at and for the six months ended 31 October 2018 comprise of the company, its subsidiary and its subsidiaries, jointly controlled entities and associate (jointly referred to as the “group”). NOTICE IS HEREBY GIVEN that the board of directors of the company declared an interim dividend (no. 36) on 5 December 2018 of 21 cents per share for the period ended 31 October 2018. The condensed consolidated interim results of Senwesbel Limited (the “company”) as at and for the six months ended 31 October 2017 comprise of the company, its subsidiary and its subsidiaries, jointly controlled entities and associate (jointly referred to as the “group”). Notice is hereby given that the board of directors of the company declared an interim dividend (no. 34) on 6 December 2017 of 19 cents per share for the period ended 31 October 2017. 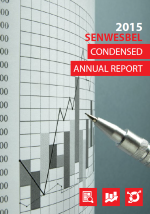 The Senwesbel board is pleased to present the condensed annual report of the Senwesbel group for the year ended 30 April 2017. This report should be read together with the complete annual financial statements on the Senwes website. An independent audit of the group’s annual financial statements was performed by Ernst & Young Inc.
Senwesbel Limited had a 52,91% interest in Senwes Limited at 30 April 2017. Notice is hereby given that the board of directors of the company has declared a final dividend (no. 33) of 15 cents per share for the year ended 30 April 2017. The proposed dividend is available to shareholders registered as such on the record date, 24 August 2017. Die twintigste algemene jaarvergadering van aandeelhouers van die maatskappy is in Kamer A, Konferensiesentrum, Senwes hoofkantoor, Charel de Klerkstraat 1, Klerksdorp, op Vrydag, 26 Augustus 2016 om 10:00 gehou. 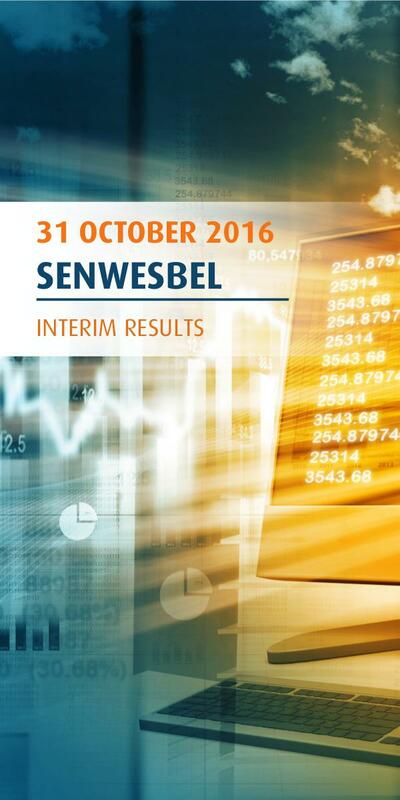 The condensed consolidated interim results of Senwesbel Limited (the “company”) as at and for the six months ended 31 October 2016 comprise of the company, its subsidiary and its subsidiaries and jointly controlled entities (jointly referred to as the “group”). 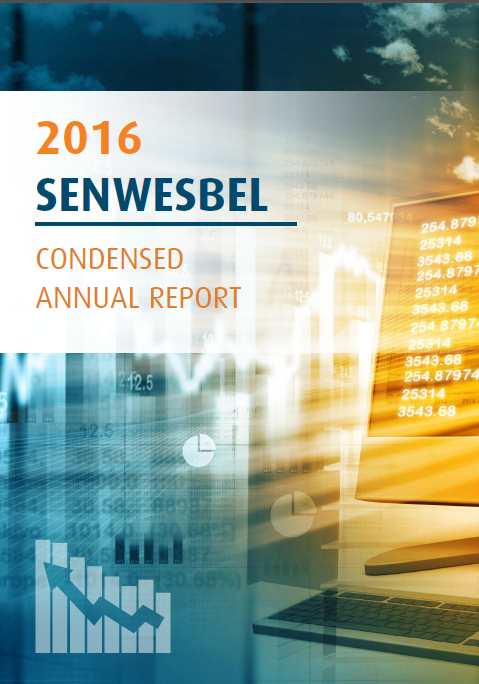 The Senwesbel board is pleased to present the condensed annual report of the Senwesbel group for the year ended 30 April 2016. Senwesbel Limited as an investment company is the majority shareholder of Senwes Limited and this shareholding is the only investment held by Senwesbel. 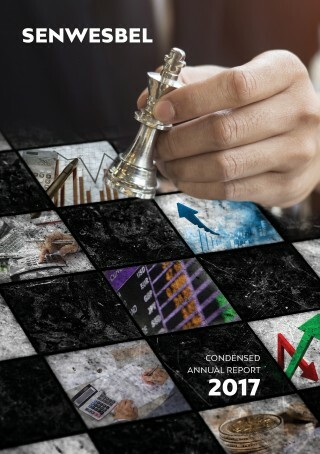 Corporate governance, operational review and sustainability reports are not disclosed in the Senwesbel condensed annual report. These reports are disclosed in detail by Senwes Limited. The Directors are responsible for the preparation, integrity and reasonableness of presentation of the separate and consolidated financial statements (“annual financial statements”) of the company and its subsidiaries, associates and joint ventures. The twentieth annual general meeting of shareholders of the company will be held in Room A, Conference Centre, Senwes Head Office, 1 Charel de Klerk Street, Klerksdorp on Friday, 26 August 2016 at 10:00. ‘n Tussentydse dividend van 16 sent per aandeel (2014: 16 sent) is verklaar. Alle aandeelhouers wat as sulks geregistreer is in die aandeleregister op 4 Desember 2015 sal dividende ontvang. Dividende sal op 11 Desember 2015 betaal word. Preview the newspaper advertisement which was placed to announce the interim results for the company on 31 October 2015. The interim condensed consolidated financial statements of Senwesbel Limited as at and for the six months ended 31 October 2014 comprise the Company, all its subsidiaries, jointly controlled entities and associates (together referred to as the “Group”). Preview the newspaper advertisement which was placed to announce the interim results for the company on 31 October 2014. 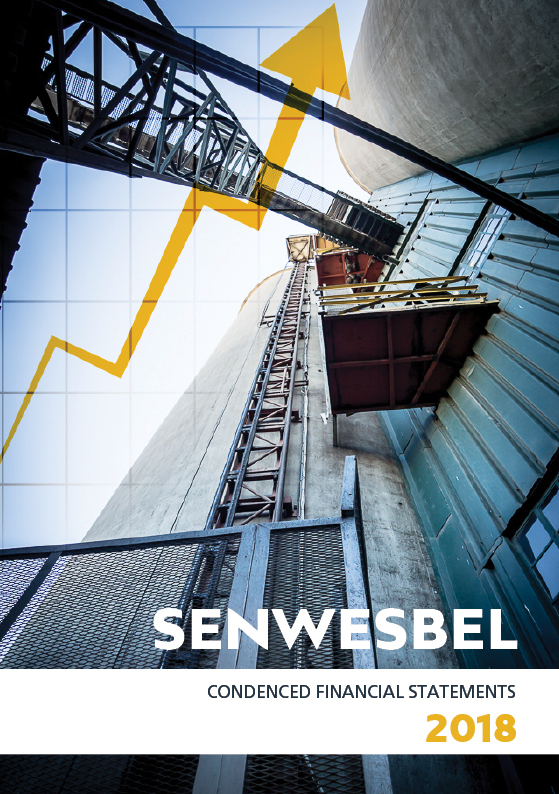 The Senwesbel board advises shareholders that it has resolved to launch a Repurchase Programme to repurchase, via a subsidiary of the Company, ordinary shares in Senwesbel (“Senwesbel Shares”) from 16 January 2015 until 30 April 2015 (“the Repurchase Programme”). We, as the investment holding company and majority shareholder of Senwes Limited, are pleased to report that the Group was able to continue on the path of entering into strategic partnerships. This process formed part of the consolidation process in the agricultural landscape.